You’ve probably seen a lot of books that address leaving an emotionally abusive relationship. However, the pros (and cons, if any are discussed) of leaving an abusive partner are usually described in a stiff, clinical point of view. This book aims to be one of the few that actually take into account the deep confusion victims feel about their abusers. 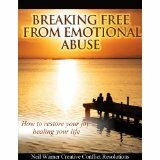 This book not only addresses how to leave an emotionally abusive relationship, but how to stay. You receive a “checklist” for each option, where the book breaks down what needs to be kept in mind, what should be prepared, and what boundaries need to be set in each case. Extra topics covered in the book are how to intervene on a friend’s emotional abuse situation, and what emotional abuse “hooks” you should avoid getting caught with. There is also a comprehensive recovery plan outlined at the end of the book. This book continues where the first part of the series (called “Emotional Abuse: The Hidden War for Power and Control in Your Relationship”) left off.